With spring in the air, windows have been thrown wide open and partygoers are spilling out on balconies all over Paris, and you need something light and easy for the spontaneous get-together. With only a small amount of preparation involved in this little canapé, it’s the perfect French appetizer, which means you’ll be able to join your guests on the balcony in no time! Smoked duck breast (magret de canard fumé) is a highlight of salads throughout France in the warmer months of the year, and just a few morsels of this smoky delight are enough to give a luxurious touch to any dish. Sliced paper thin, with a delicate, woody flavor, smoked duck breast goes remarkably well with a variety of ingredients, making it an ideal choice for including in your canapé menu for l’heure de l’apéro, when dinner guests arrive and glasses of wine and plates of canapés are passed around. Finely sliced smoked duck breast is the star of this recipe, but the goat cheese also deserves a special mention, being traditionally at its best from April to September. 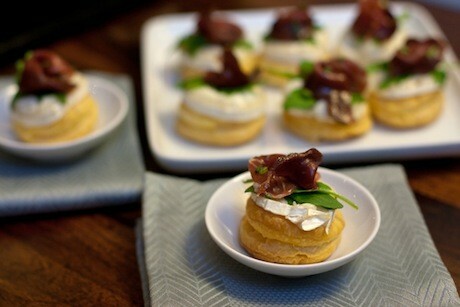 When you combine smoked duck with the earthy flavor of warmed goat cheese, perched atop a few greens and light-as-air puff pastry, you have a tiny salad in a single mouthful, which manages to bridge the seasons perfectly. 2. Using a cookie cutter, cut the puff pastry into approximately 16 small circles or squares (slightly larger than the diameter of the rounds of goat cheese). 3. Bake the puff pastry for 5 minutes, until nice and puffy. If the tops start rising unevenly, press down on the higher side with a teaspoon while they’re still cooking, and they should even out. 4. Remove from the oven, then on top of each pastry base, place a slice of goat cheese, and a sprinkle of thyme and black pepper, then bake for another 5 minutes. 5. Remove from the oven and arrange on a serving plate. 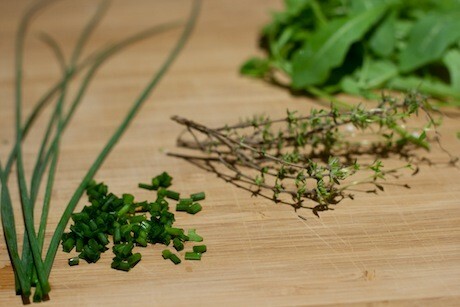 Place a couple of small pieces of arugula and a slice of duck breast on top of the goat cheese, drizzle a few drops of olive oil on each one, along with a sprinkle of chives. Serve immediately. 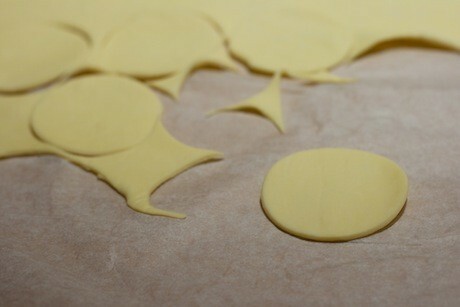 To save even more time, the puff pastry bases can be cooked a day in advance and stored in an airtight container. Editor’s note: If you are a foodie heading to Paris, why not download one of our three gourmet walking tours or our package of foodie walks for the iPhone?